Now through December 21st only, you can purchase The Vala's Pumpkin Patch Cookbook right here online. The Vala sisters rounded up their favorite family recipes and farm favorites from the pumpkin patch, including Succotash, Apple Pie with All-Butter Crust and Pumpkin Bars. 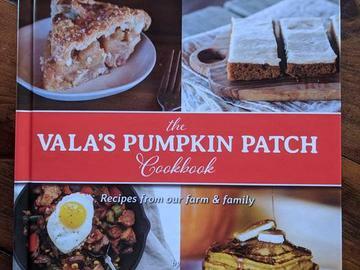 This cookbook, filled with full color photos and stories from the farm, is a great way to take a piece of Vala's Pumpkin Patch home with you, to enjoy year-round.